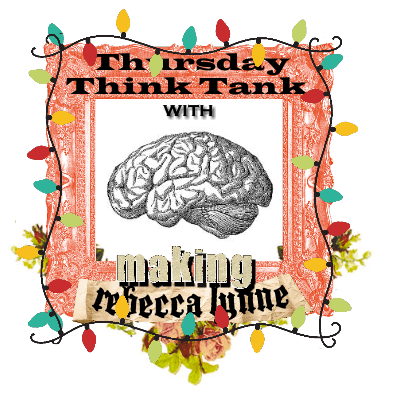 Today I’m part of Making Rebecca Lynne’s Thursday Think Tank Holiday Blog Hop! The Blog Hop features bloggers from around the world who are showcasing DIY Holiday ideas. 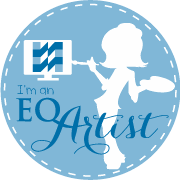 My first blog hop – is it silly that I’m a little giddy about this? 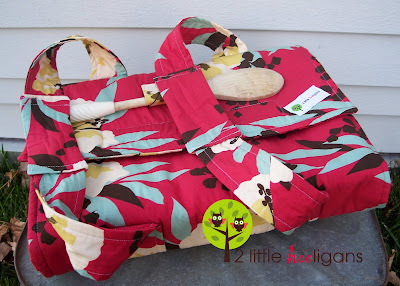 I hope you will join in the linky party and share your Holiday DIY Ideas with us all! There will be a giveaway drawing from everyone who links up to any of the TTT Holiday Hop posts, so be sure to check out Rebecca’s post from last week, as well as all of the upcoming posts. Rebecca will draw the winner on December 27. For those new to my blog, a warning: I don’t write short posts. I can’t help myself. Just keep scrolling – there are some awesome photos and links! Of the eight bloggers participating in this hop, only Rebecca and I are in the United States, so that made my choice of a Thanksgiving themed post very easy. Here’s my typical Thanksgiving: Shop a little in the morning, catching the two or three stores that are actually open that day. Whip up a side dish or two, or maybe a couple of pies, or, in my favorite scenario, both. (What can I say, I’m a glutton both in the kitchen and at the dining room table!) Head off to my aunt and uncle’s house for some family time that generally includes half of the family gathered in front of the television for football, and the other half hanging out in the kitchen for wine and conversation. When the turkey pops, we fill our plates, then our bellies, then pass out. An hour or so later we pull out the newspaper or bring up the website and three or four of us take in a late movie. Thursday Think Tank is all about sharing the creative ideas that we’re working on, whether quilting, cooking, crafting, decorating or anything else. My Thanksgiving theme led me in a couple of directions. First, since my Thanksgiving is all about the food, I’m researching possible dishes that will work well for a potluck. That led me to the second part, a hostess gift. I’ll be honest, we don’t usually bring a gift for the hostess, but Jean has been responsible for family Thanksgiving for more years that I can count, and I’d love to do something nice for her. 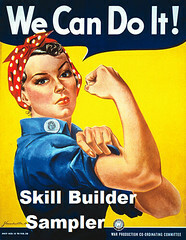 In researching topics for this post (because I am the Research Queen – nay, Goddess! ), I came across several posts that talked about potluck etiquette. At first I scoffed, but some of them really made sense. Sure, I’d love it if no one brought store-bought stuff, but the reality is some people have to travel, and others just can’t cook. The most important thing I took away from it, though, was not to plan on any refrigerator or oven space. Fridge isn’t such a big deal – I’m in Wisconsin, and in late November the garage is one big refrigerator – but oven space is critical. I hereby resolve to never again bring something that needs to be heated or *gasp* cooked from scratch (yes, I did that once). It’s crockpots or casserole dishes in insulated carriers for all hot food from now on. I’m totally making this! I could even make two, one for me, and one to give my aunt as a hostess gift. Or is that too weird? “Hi, here’s my food, plus a random hunk of insulated fabric that I think is totally adorable but you think looks like the back end of a donkey, and hey, you get to find a place to store the thing now!” No, seriously, I’m asking for your opinion. Is that a good hostess gift? 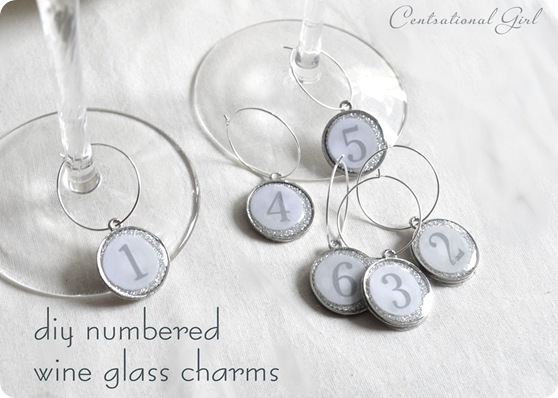 Here’s a lovely wine charm tutorial using sea glass to create the wine charms, from Creativity in Pieces. 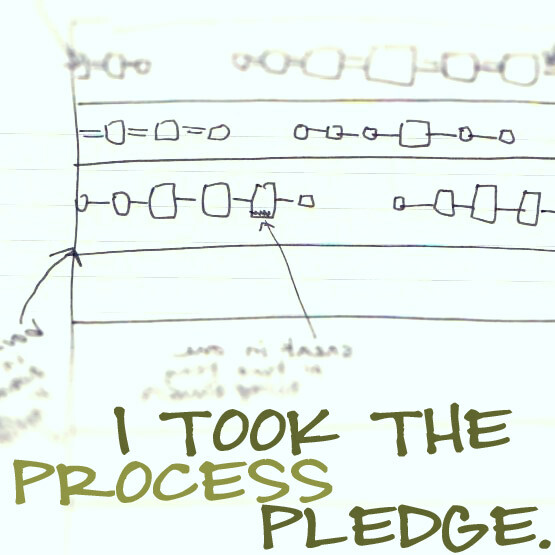 From her site you can even go to a You Tube video tutorial for this project. 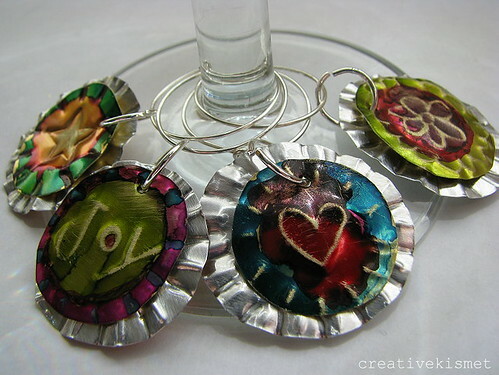 Be sure to look at her post, because she did four different types of charms, and then turned them into jewelry! 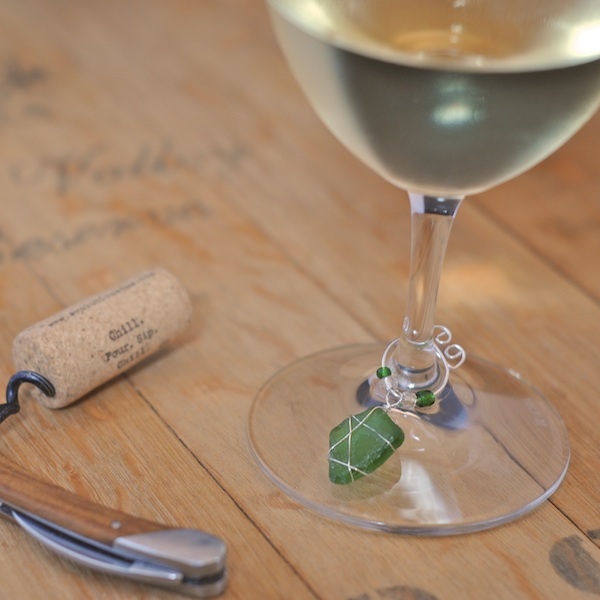 In my searches, I spotted this on Real Simple: use shaped rubber bands as wine charms. Ooh, now that’s clever, but it isn’t much of a hostess gift. These adorable, elegant acorn wine charms from the blog Alicia Policia win my vote for most beautiful AND most frugal, since they use real acorns she picked up in her yard! I don’t have acorns, but I’ll have to think about “found objects” creations. 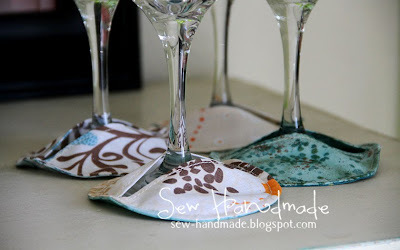 Finally, for the most beautiful laser cut felt wine glass coasters, check out dimlim, who also has an Etsy shop. Portions of her blog are in Dutch, but the photos have English titles, and her photos are so well done, you almost don’t even need the words. Sweet Anna’s Homemade Pure Vanilla Extract – any leftover vodka can be used to make fabric spray! 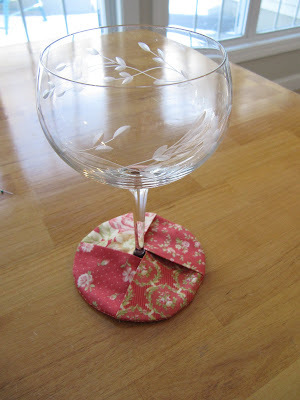 Tile Coaster Tutorial from The Cottage Home – uses scrapbook paper, but I bet it would work with fabric. Grandmother’s Favorite knitted dishcloth, from Ravelry – I don’t knit, but if I did, I’d grab a ball of cotton yarn and make these! I’ve always loved knitted dishcloths. 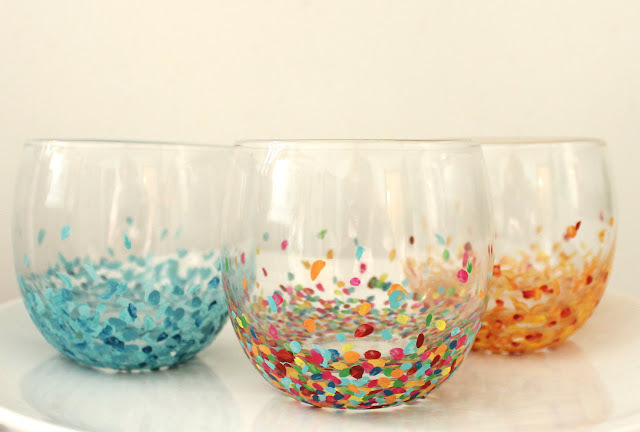 Chalkboard Wine Glasses tutorial by Just Short of Crazy – forget charms – some inexpensive wine glasses and chalkboard paint takes care of it all. 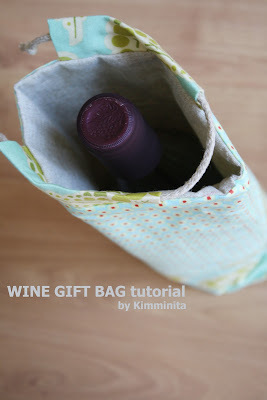 Sweater Wine Sleeve tutorial at Hannah James Blog – cute, quick, and clever. 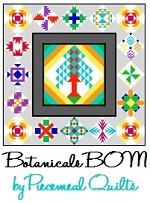 Could also embellish with ribbon as trim or tie. My mom cannot celebrate Thanksgiving without pumpkin pie, but my aunt doesn’t like pie crust (she actually scoops out all of the filling, leaving a perfect, empty crust on her plate). My solution? Double the pie filling recipe, fill one crust and put the rest in custard cups. Everyone’s happy! I’m mostly happy with the pumpkin pie recipe I have, but that doesn’t stop me from checking out other options. When it comes to pumpkin pie, there are three choices: canned pumpkin pie mix, canned pure pumpkin, or fresh sugar pumpkin, roasted and pureed. My opinion, pumpkin pie mix isn’t really an option. I use a great recipe from Cook’s Illustrated that uses canned pure pumpkin, cooked down in a sauce pan. (If you’d like to try it, the version I use can be found here at The Delicious Life blog.) I tried using a sugar pumpkin once, years ago, but wasn’t thrilled with the results. According to this post from The Art of Doing Stuff, her scientific double blind survey showed that 9 out of 10 people preferred “pumpkin” pumpkin pie. Now that I know how to roast squash, I might have to give it another try. Actually, there might be a fourth “pumpkin” pie option – I could roast a Carnival squash and use that instead. I KNOW how awesome that kind of squash is, and I feel a little safer with it. The trick is roasting the squash without letting Mom know that I’m going to use it in the “pumpkin” pie. Whoops – that cat is out of the bag – she reads this! 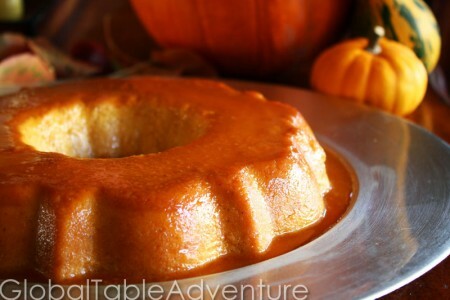 This Pumpkin Flan recipe by Global Table Adventure looks beautiful and can be made ahead, simply unmolding it after you arrive. Mmmm… pumpkin custard with caramel sauce. I’m drooling. 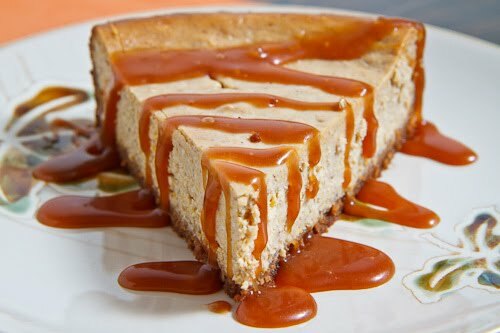 Or what about this Pumpkin Pie Cheesecake from Closet Cooking? I LOVE cheesecake, and I think the tanginess of cream cheese really compliments the sweetness of pumpkin. Plus there’s the whole caramel sauce thing! Pumpkin Crunch “Cake” by The Picky Apple – This is essentially a dump cake, made with a cake mix. It isn’t really cake, more of a custard with a crumb topping. Pumpkin Roll by Sweet Pea’s Kitchen – I made a chocolate cake roll in high school French class (the Christmas buche de noel), and it was surprisingly easy. I’d love to try this pumpkin version. Layered Pumpkin Chocolate Cheesecake Bars by Hostess with the Mostess – Gah! Pumpkin, chocolate AND cheesecake? I’m all over this one! I found this (and several other recipes) through Tasty Kitchen, my favorite recipe resource. I MUST make a sour cherry pie, since I picked up a tub of frozen sour cherries when we were in Door County this summer. It’s been awhile since I made a sour cherry pie (the cherries are sour and sugar is added to make a sweet pie – the pie itself isn’t sour!). I found a couple of possible recipes, one from Nothing in the House and this version with an almond crumble from Smitten Kitchen. Do you have any favorite pie recipes? The potatoes can be made a day or two in advance, then baked the day of your potluck. Once baked, they stay hot a long time, so no need for oven space from your host. Stuffing (or dressing, depending on where you live) is required at Thanksgiving. My aunt still puts some inside the bird, though it’s not always recommended for health reasons. Instead, try this crockpot version From Valerie’s Kitchen. It’s a basic recipe that you can add to if you’d like, but it takes up no oven space and it’s soft like the stuff that comes out of the bird. I’d like to try combining this method with K&K’s Test Kitchen recipe for Turkey Sausage, Apple & Cranberry Stuffing. Are you a sweet potato fan? I wasn’t until a couple of years ago. My experience was limited to marshmallow topped canned “yams” with brown sugar. If that’s your thing, more power to you, but for me it was a bit too much sugar. And I like sugar! I usually enjoy my sweet potatoes baked, then topped with a little butter and a sprinkling of Penzey’s Smoky 4S Season Salt. 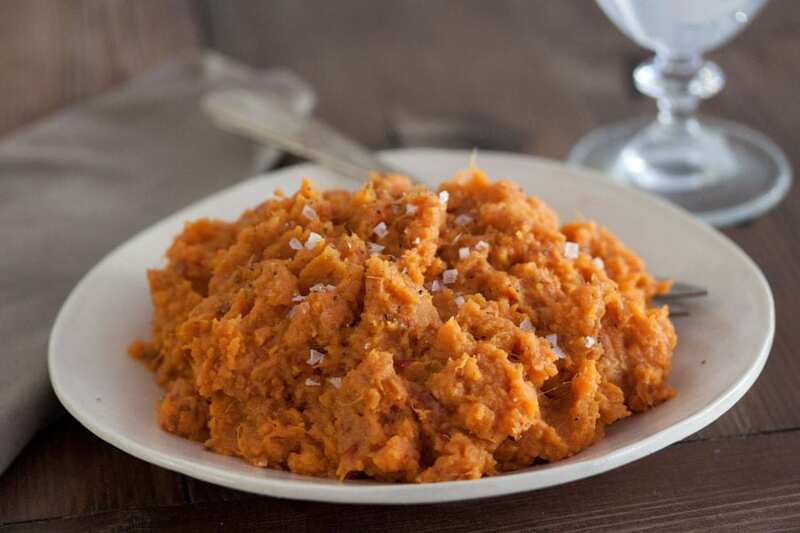 This Chipotle Mashed Sweet Potatoes recipe by What’s Gaby Cooking is right up my alley! 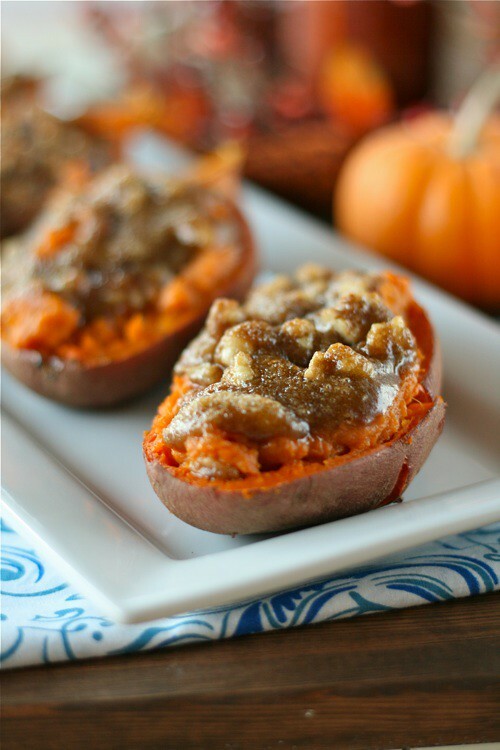 If you’d like to stick to a sweeter version, try this Twice Baked Sweet Potatoes with Walnut Streusel recipe by Lauren’s Latest. It’s still sweet, but no marshmallows in sight! Have you tried Quinoa (it’s pronounced keen-wa)? It’s pretty good! This recipe from With Style and Grace is gluten free, as are most of the recipes on her blog. I have relatives on both sides of the family who have problems with gluten and it’s becoming more prevalent, so it’s great to have a recipe like this in the Thanksgiving arsenal. The classic Broccoli Salad is a family standby. In Foodess’s version below, she substitutes cashews for our typical sunflower seeds, and adds red peppers. I love the idea of tweaking it a bit – cranberries instead of raisins? My Door County cherry vinegar? 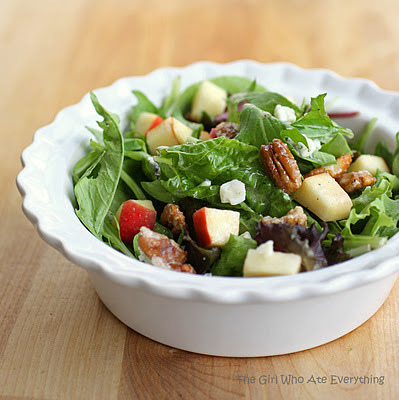 Then there’s this Candied Pecan, Apple and Gorgonzola Salad from The Girl Who Ate Everything (love that blog name!). I love the combination of sweet, tart, bitter and salty and this salad does it all. If you don’t want to make the candied pecans, you can buy them already glazed. I like the Emerald Pecan Pie glazed pecans, in the green reclosable bag, but Fisher also makes a candied pecan and I’m sure there are others. The glaze on these will be a lot heavier than your homemade pecans, though. She also offers this beautiful Strawberry Spinach Salad. I couldn’t pick just one! Right now she has Thanksgiving recipes listed on the right side of her blog, and you can see a list with photos in this post, too. I’m seriously checking out several of them, like the Pumpkin Whoopie Pies, Pecan Pie Bars, Pumpkin Spice Rolls (I love homemade bread! ), and even these Stuffed Mushrooms. I don’t even like mushrooms. Seriously, she’s my new favorite food blogger. Okay, now that my head has completely exploded, it’s your turn. What about you? Any hostess gift suggestions? Any favorite potluck recipes? Click below to join the Linky party! Thank you to all of the craft and food bloggers who gave permission for me to use the photos! Be sure to click on the photos to go to their blogs for lots more inspiration! Because my blog is hosted by WordPress.com, I can’t show links directly on this page. Click here to enter your link or to view this Linky Tools list. Remember, everyone who links to any of the Thursday Think Tank Holiday Hop posts will be entered in a drawing! Some interesting recipes here but since I’m in Australia and we don’t have Thanksgiving and it’s the middle of summer, they may not be the thing I need right now. 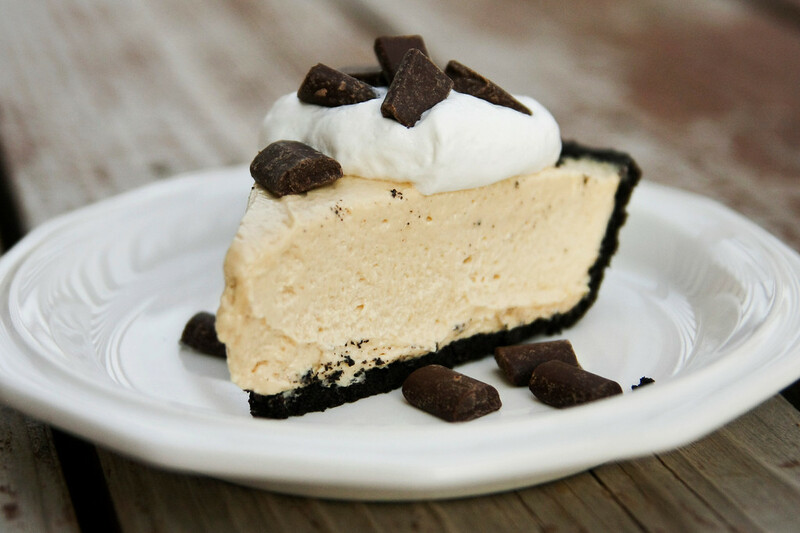 Although the cheesecake looks delicious and cheesecake is very edible anytime! Plus, having read your post, I get the feeling that what we call pumpkin (as in a vegetable we roast for dinner) might be what you call squash! My dad used to like something called gramma pie (I’ve never had it because mum wouldn’t make it) — perhaps that’s equivalent to pumpki pie? Finally, your tips on bringing food to a pot luck were great. As for the gift for your aunt — does she attend many potlucks herself? Is it the sort of thing she would actually use? According to Wikipedia, our pumpkins are a specific kind of winter squash (like Carnival, Acorn, Butternut, Spaghetti, etc.) while for you, “pumpkin” is the name for all winter squash. Pumpkins are round and orange, and can fit in the palm of your hand or be as big as a small car. They are used whole as decorations in the fall, and we carve faces in them and put candles in them. Most pumpkins are too stringy and watery for eating (although we wash the seeds and roast them with a little salt for a nice snack). Sugar pumpkins are smaller and have firmer, less stringy flesh. We roast all kinds of squash, including pumpkin, as a vegetable, but most also can be made into sweets. As an Aussie, the idea of pumpkin pie kind of sickens me (no offence, but ewwwww!) so I’d lean towards the pumpkin cheesecake, because who doesn’t love cheesecake!! Although I chocolate one without the pumpkin is more my cup of tea (and my standard potluck dish). I love the idea of those little mozzarella and tomato toothpicks. That is a fabulous idea and will have to make a reminder when it comes to my turn to bring a dish that’s not dessert. |Loved your post Sandi! Our Thanksgiving (look north!) has already come and gone, but all you hints and recipes have me wanting a do-over! Doesn’t everyone use the garage as a fridge? As for a hostess gift, I think the casserole carrier is a great idea. Our supper club all got them one year, and they are very well used! Great post! So many ideas! I think the casserole carrier is a great hostess gift. And those cap fees skewers look like a perfect appetizer. So many goodies here, it’s hard to decide what to comment on! I have been known to bring a dish that needs heating to a family potluck, but then I bring my Nesco-knockoff roaster and plug that in and use it as a second oven. Works like a charm. I LOVE those acorn wine thingies! What a cool hostess gift that would be. Thanks so much for giving Nothing-in-the-House a shout out! Gotta say, our sour cherry pie recipe is pretty darned good. I’m so jealous of your frozen sour cherry stash! Wow! You really did some research! I love your post full of ideas! I do think a casserole carrier would make a lovely gift. Great post. 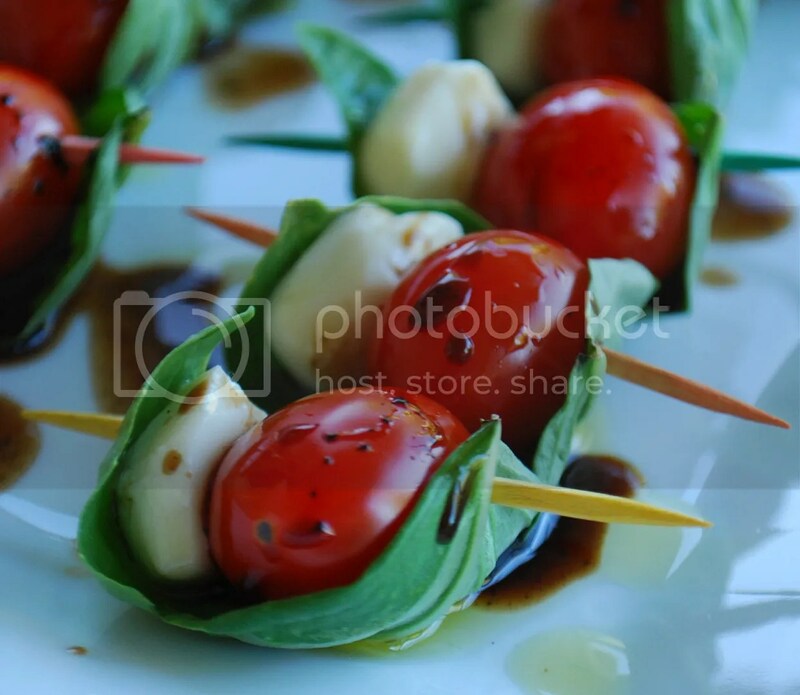 Love the caprese skewers recipe idea. Thanks! What a fun post, Sandi… so many good gift ideas and recipes! Thank you for sharing my make ahead recipe for Thanksgiving Mashed Potatoes! Thank you for sharing my Caprese Skewers. I’m so glad you liked them! This is one of the best Thanksgiving post online! This is a one-stop shop for all the things we need to make a fantastic Thanksgiving party. Just to share, I also like giving classical artwork as TG gifts like paintings and glass figurines from Russian and Italian artists. These artworks are beautiful and timeless, it also gain value in time. 🙂 I buy my gifts online like ebay, Glasslilies and in art galleries.